To be Translucent, or not to be? Discussion in 'OS X Yosemite (10.10)' started by swindlenz, Jul 13, 2014. I know there are sever thread with regards to screen shots and dark mode, but I feel if this was a post it would just get buried. I prefer the translucency, doesn't really affect the readability of the menu and it looks nicer IMO. While I personally agree with merrickdrfc that the translucency is maybe a bit prettier, I think both options look great, which is actually perfect as it gives us the option of each choosing what we prefer from light or dark, translucent or opaque. I do prefer the translucency, though I can see why people would turn it off. It does makes it a tad more readable without it - especially the dividing lines between each 'set' of options in the menu. Generally I don't agree with the translucency. Never liked the transparent menu bar. Don't know what purpose the translucency serves. It Makes a mess of Vista and Win 7 and adds visual clutter to the GUI. I can't see any reason why I should like it in OS X. Yes there is an argument from the designers at Apple that translucency serves to indicate to the user their location in an app in context to content scrolled up the page but in any ways it looks horrid to counter any advantage this gives. I have seen it at play in Xcode in the Navigator pane. It looks like somebody is punching holes in the interface and with the translucent menu bar everything looks like it is blending into each other, a great way to reduce the distinction between apps and windows. Unfortunately, in the shots above, the un-translucent version looks a bit flat. I would go for the non dark version, CLI the Dock to dark mode, and then kill the goofy Finder Icon and re-instate his more reserved and clever brother. I'm really in a great mood tonight. Been on Windows all day. I much prefer it, looks much better. Is it possible to keep the menu translucent but kill it in windows? Basically, like Mavericks. Probably with a plugin for whatever controls the menubar but not stock. I'm still kind of torn between the two, I've been switching back and forth, but I think I like it non-translucent better (with dark mode at least). I think it will probably depend on which background I'm using for me. I love the frosted glass effect. It gives me a nice feeling like sitting on my patio next to the beach and enjoying a nice cold drink. I am actually having an issue with translucency all together. I upgraded from DP2 to DP3 looking forward to use Dark Mode. However, when I toggle On/Off Translucency it isn't translucent. The setting does not change even if I reset. Now when I try to use Dark Mode I have it in the ugly non translucent dark mode. I have asked around the issue but I have no idea how to fix it. I upgraded from DP3 to DP4 looking forward to use Dark Mode. I fixed the post. Although, it is pretty clear what my issue is. The menu bar is only a minor problem: I will only install it if you can disable ALL translucency, especially on the side bars, drop down menu's, safari empty screens, spotlight result windows etcetera the translucency is totally annoying. I just have to say your desktop picture + Dark Mode looks awesome! Does this truly add dimension? a quick show of hands, please, people. Which of the following do you see? an unnecessarily messy background to the text content. 2. The dark statusbar and dock look pretty nice, but the contrast between them and the finder windows being so bright is not so nice. 3. I absolutely hate the way my taskbar icons look in dark mode (see pic attached.) I mean, they're completely fine in light mode, but look stupid in dark. I don't know what the OS does for the ones that do turn from black to white, but it's clearly not doing it for all. Use in the dark: is there awareness of f.lux software? this one is, to people who sometimes use a Mac in relatively dark environments.  automatically makes the color of your computer's display adapt to the time of day, warm at night and like sunlight during the day. some combination of the two? I discovered f.lux around fifteen months ago. IMHO it's great idea, smartly implemented. This post is not a suggestion that Apple should implement f.lux functionality (it's patent pending). Rather, I'm curious about the perceived effectiveness of Apple's dark mode in dark environments. More importantly do you have a direct link to that gorgeous wallpaper? 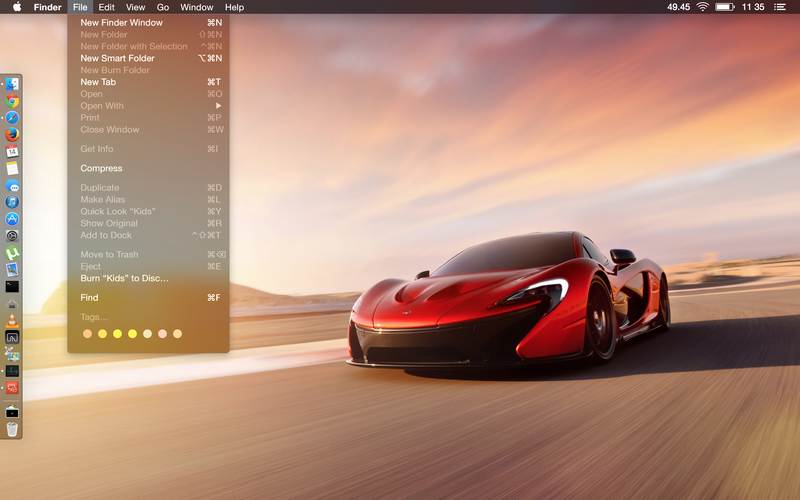 It looks amazing with Yosemite. I've been using f.lux for a couple of years now, on all my computers and on my iPads (with jailbreak). F.lux is absolutely great, it reduces the strain when working at night. As for the OS's dark mode, I see it more as a pleasing aesthetic change than an actual workplace utility, as the areas affected by dark mode are minimal, so all my sadari/chrome/finder windows are still way bright. And on the day before Yosemite was released, Mr Benn left his house at 52 Festive Road, intending to buy the classic Coupe ceramic dinnerware that translucency had presented to him whilst spying on a conversation between Matthew Reiff and his family about orange sunsets, whale spouts and a condor. Mr Benn arrived at the costume shop. As if by magic, on 16th October 2014 the colourful fancy-dress shopkeeper appeared. He tried it on. But where previously he had seen a screenshot of translucency, there now appeared  as if by magic  a single horizontal line. What a lovely cartoon that was. Mr Benn was a lovely cartoon too. where is the option for translucency?